Writing towards wholeness and finding the courage to become who I am meant to be. Welcome to one of my favorite traditions of the year! My annual recap of things I loved, liked, learned and lost…I actually don’t think there’s anything I lost on this list, I was just going for the alliteration. Every year I do this on my birthday. It’s like a digital scrapbook. It’s fun to go back and read past ones, starting at my 22nd year of life and see that A. I’ve actually been blogging that long…what?!?! B. So many things are still the same. C. So many things are very different. D. I’m thankful for this tradition and the rhythm of reflection it initiates. 1.) I have a new niece! I’m officially an auntie to 7 blood nieces and nephews and a few other nieces and nephews-in-love and it’s just the best. Makes Christmas more expensive and I’m racking up those airline credit card points, but it’s worth it. 2.) I started the practice of lighting candles every day as a way to be present and center myself. 3.) I became gluten free. Ugh. I could go on, but who likes the person that talks incessantly about their food allergies. No one, that’s who. 4.) Two of my friends and I moved a literal tree that fell across a road that was blocking our path to get to a conference. It was raining, one of us had a boot cast on and it was dark. At one point I said, “we can’t do this.” Sara looked at me and said, “Don’t say we can’t because we can.” And then we moved the tree. Now we have a new life mantra and don’t worry, we can draw so many life metaphors from this experience. 5.) Tried using an all electronic calendar system. Didn’t work. Paper planners for life! 6.) Sought to learn from and listen to more non-white people and those of the global majority especially black and indigenous women. Really was confronted with my own racism and what it means to truly engage in anti-racism work and what it means to do my own work of uprooting that racism and white supremacy in my own life. Part of this is learning that discomfort is a gift and it’s okay to be uncomfortable. Some people I’ve learned a lot from this year: Rachel Ricketts, Rachel Cargle, Christena Cleveland, Layla Saad, Kaitlin Curtice, Saira Siddiqui and Austin Channing Brown. Listen to them, learn from them, and compensate them for their work. 7.) I bought a new to me car. I love it and am grateful for it every day. 8.) I signed up for TSA pre-check. Best decision I made all year. I did a lot of traveling this year and TSA pre-check was a game changer. 9.) I went on a great vacation to one of the best places on Earth (Northern Michigan) with most my family except for the Chapman’s because they were busy having a baby (Refer to point #1). The WHOLE family was together for Christmas…16 people under one roof. We just love each other even more after all that time together…also, we now all currently have colds. 10.) I began a job as the Assistant Director of Coach Approach Inc. and Day 7 Ministries. We help nonprofit professionals and pastors get connected to self-care resources so they can lead healthy and sustainable lives. I also went back to my marketing job for a couple months to cover for my former boss’ maternity leave. And was trained in a new role as a Search Specialist with Ministry Architects. I’m grateful for all that I can learn from my various employment opportunities! 11.) Some movies and TV watched: Black Panther, To All the Boys I’ve Loved Before, Avengers, The Guernsey Literary and Potato Peel Pie Society, Queer Eye, Outlander, Supergirl, The Hate U Give, Son of Patricia - Trevor Noah, Patriot Act with Hasan Minaj. 12.) I went to Argentina with a group of Trevecca students. I know I can’t know exactly what it’s like being a mom, but leading a group of college students across the world definitely gives me a glimpse. 13.) My business is alive and well. I get so much joy out of everything I get to do with Abby Buter Coaching. I was able to speak, lead workshops, work with organizations, host retreats and meet with clients one-on-one this year. I will never take for granted the honor it is to walk alongside others and hold space for them as they learn more about themselves. 14.) Lake Michigan will always be my peace place and center me. I was in Chicago for a conference and I was wandering around outside. I didn’t realize we were so close to the lake and as soon as I turned a corner and saw the lake, it’s like my soul was home (even though we all know that’s not the good side of Lake Michigan…). It’s kinda weird, but mostly magical. 15.) I packed a carry on for a ten day trip across three climates and three cities. One of my greatest accomplishments this year. 16.) ASMR Harry Potter rooms. Look it up. Listen to it when you have to concentrate or relax. You’re welcome. 17.) I realized I love wearing lipstick. You can feel like you’re falling apart, but a good, bold, red lip brings it all together. 18.) Some podcasts I listened to: The Popcast with Knox and Jamie, Doctor Death, 36 Questions, Truth’s Table, Code Switch. 19.) I learned what it meant to show inner hospitality to all the parts of myself. The good, the bad, the ugly, the beautiful, the shadow, the light…they’re all a part of me. Showing them hospitality and acknowledging them has led to so much healing and growth for me. 20.) I saw Hamilton again. Worth. Every. Single. Penny. 21.) I continued going to spiritual direction monthly. If I had to point to one decision and regular rhythm that has made the greatest impact on my life the last four years, going to spiritual direction would be it. 22.) I found the Imaginarium community. I could write a lot of words about this. But all I’ll say for now is this is a community and people I’ve been looking for and I’m so grateful. 23.) Some books I read: Anam Cara by John O’Donohue, Becoming by Michelle Obama, The Hate U Give by Angie Thomas, So Close to Being the Sh*t, Y’all Don’t Even Know by Retta, What is the Bible by Rob Bell, Children of Blood and Bone by Tomi Adeyemi, We’re Going to Need More Wine by Gabreille Union, Whisper by Lynette Noni, Troublemaker: Surviving Hollywood and Scientology by Leah Remini, The Glittering Court Series by Richelle Mead. I read a lot…I tried to shorten this list, which this is the shortened list. I just really liked all these books. 24.) 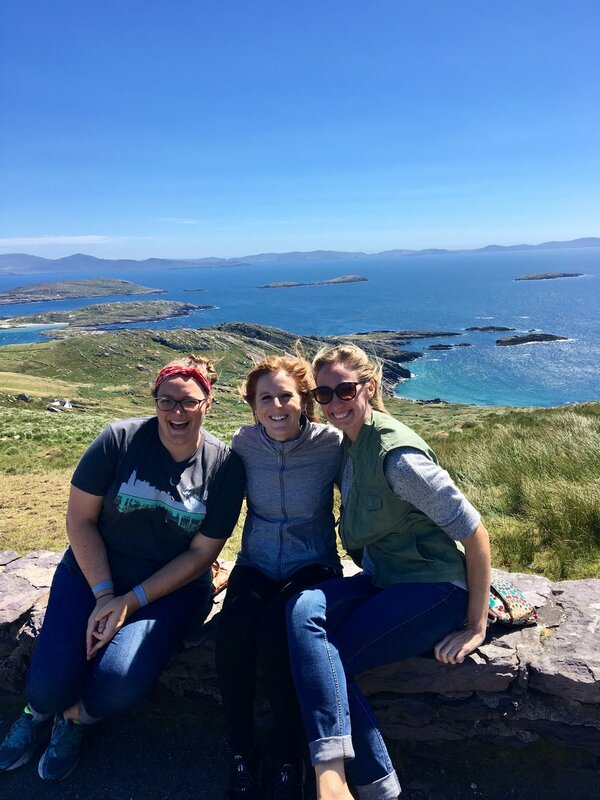 I went to Ireland! It was beautiful and magical. It has a special feel to it that’s hard to explain. I loved it. 26.) Some music I listened to: Johnnyswim, Hamilton, Avett Brothers, Janelle Monae and the radio. 27.) Went to NYC to celebrate Jenn’s 30th! It is my favorite city and I just love it! I’m going back next weekend to see Harry Potter and the Cursed Child (ah!!). If you would like to witness how terrible I am at saying no, ask me to go to NYC with you. I’ll always find a way. 28.) Attended the Evolving Faith, Liturgists Gathering, the Festival of Faith and Writing and a few Enneagram workshops - these were all significant experiences for different reasons. The content, the speakers, the people I got to attend with and just the overall experience was special. 29.) I stopped writing this year. I guess for a lot of reasons. But I learned that I’m more fully alive and human when I’m writing. It’s like breathing to me. So the plan is to start that as a daily practice again. 30.) My word of the year was abundance. I shed a lot of my scarcity mindsets and saw abundance around every corner in many ways. I loved being 30. I think I’m going to love being 31 too. My word for the year is Intentional and I’m excited about what’s ahead. Here’s to year 31 and all the cups of happy! It's time for one of my favorite things of the year! I've always thought of this post as a digital scrapbook of my life and it's been fun to hear others mention to me that they like to see it too. I'm especially excited about this birthday because I turn 30! I know some people dread this birthday, but I'm excited about it. I think getting older is a beautiful thing that brings more and more wisdom to your life. And I hear your 30's are pretty great, so I'm looking forward to it! 1. So many babies. Are we surprised this is my #1? My two nieces were born this year, Opal Kay and Natalie Grace, we officially added three nephews when my sister got married, and then a couple friends who are pretty much family had babies too. So basically I became an auntie like 8 times over this year and I love every second of it. 2. I was on a podcast!! This was a dream come true. I'm hoping that there's more of these in my future. I was on the Our Daily Rest podcast talking about self-care and the Enneagram. You can listen to it here. 3. The Skimm. Do you read this? If you don't you should and here's a link to sign up for it. You're welcome. It's a daily email that skims the news and helps you stay informed, but not overwhelmed. 4. I renewed my passport in January just because it was going to expire and a couple weeks later I get a call and was asked...do you have a passport? I was offered the chance to lead a trip of Trevecca students to Croatia. It was one of my favorite parts of the year! I met beautiful people and spent time in a beautiful country. It's a trip that will forever stay with me. 5. At any given time this year I was working 3-5 jobs. Life of an entrepreneur/new business owner I guess. It can be overwhelming at times, but I actually really like it. Every day is different and I love the flexibility. Movie: Wonder Woman, The Greatest Showman and Moana. TV: Super Girl, Hart of Dixie and This is Us. 7. It was my first full year of running Abby Buter Coaching. Some days I thought I would quit, other days I felt like I was living my best life, most days I realized I had no idea what I was doing, but did it anyway. After every coaching call, retreat or workshop I felt so good and knew that this is what I was made for. Also, apparently I talk with my hands a lot. 8. I highly recommend everyone join a therapy group on shame. Ask me how I know. 9. I've reverted to childhood and eat peanut butter and jelly sandwiches for lunch probably way too often. 10. I tried to be better at stopping to celebrate! It can be easy to charge ahead and forget to acknowledge the good things that have happened. A lot of really great things happened this year and I don't want forget that. After something great happens to celebrate I listen to this song. 11. I SAW HAMILTON. Like in real life...I was in the freaking room where it happened. It was magical, beautiful, emotional, amazing, really any adjective that describes how amazingly surreal and incredible something can be. 12. I make rice a lot because curry...but every time I make it, it really doesn't turn out. It never soaks up all the water. I know this should be easy, but it's not. Uncle Ben's instant rice to the rescue. 13. I started staying with an elderly woman every once in awhile. It's one of my favorite things. Not just because she reminds me of when I lived with my own grandma who I miss a lot, but because she's so fun and loving. We eat dinner and watch NCIS, Blue Bloods, Golden Girls...basically all the TV shows. 14. Jenn and I started using Shipt. We grocery shop from our couch. It's wonderful. 15. I went to the Women's March in Washington DC. Sometimes I forget I did this because we literally drove through the night Friday, marched Saturday, woke up early Sunday and drove back. It was worth it though. Experiencing history was extraordinary. 16. I realized I'm really disconnected to my body. Sarah Bessey wrote a blog about this very thing and I cried reading it because she articulated what I've been trying to write down and say for months now. You can read it here. I still have a lot to work through and process, but my connection with my body is something I am being intentional about this year. 17. Bullet journal. Do you know about this? I avoided it for awhile because it seemed overwhelming, but then I decided I'll do what I want and took what I liked and left the rest. I'm pretty sure what I ended up with isn't really bullet journaling, but whatever, I do what I want. 18. I made an effort to drink lots of water every day. I feel so much better. You should try it. 19. I got better at recognizing my natural rhythms. I can be super productive from 9pm-11pm and I work better in spurts than long stretches. I also went through a two month span of traveling a lot and realized I need some good time at home between trips. 20. I went to a Michigan State basketball game with my brother. It was great to see them play live and it was the catalyst for one of my goals this year - watch more MSU basketball. 21. Two of my favorite people got married, my sister and my friend, Hannah. Both weddings and the festivities leading up to it were so much fun! 22. 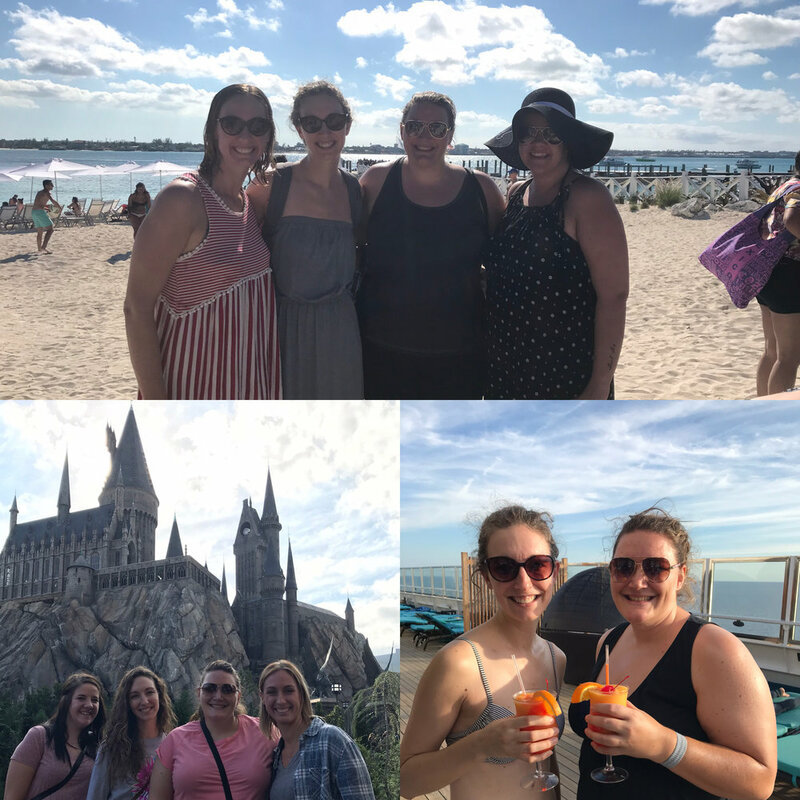 I went to Harry Potter world and on a cruise to the Bahamas!! Three of my beautiful friends joined me to celebrate my 30th birthday. We started our trip at HP world and it was magical and then went on a 4 day cruise. It was fun, relaxing, beautiful and such a great time! 23. I was on two book launch teams - Shalom Sistas and Where the Light Falls. It's always fun to read books in advance and promote them. I recommend both of these! 24. I've loved the Enneagram more and more. I've loved coaching it and teaching with the Enneagram. I've also been doing my own work with it and growing a lot. It's such a powerful tool for transformation. I also started the Backyard Series (which there's an online version, sign up here!) and it was so fun to host! 25. I found my theme song for 30. Listen to it and try not to love it. Also, go see this movie! 26. I joined Planet Fitness and people watching is my favorite thing. I've seen some pretty intense dance moves while on the treadmill and a full-on singing performance including kicks on the stairclimber. 27. I loved Harry Styles new music. Yes, he's from One Direction. No, I'm not categorizing this as a guilty pleasure. Yes, I did decide he gets his own space on my list. It's that good. 28. If you ever wondered if it was possible to binge watch YouTube videos...it is. Because can you really get enough of carpool karaoke, One Direction songs or Hamilton clips? Asking for a friend. 29. I am filled with so much gratitude. I've implemented an intentional practice of gratitude this year and it's a game changer. It makes me feel better, it grounds me, it helps me stay present. There's really no reason not to integrate a gratitude practice into your life! My 29th year was one of finding my footing, of settling into this idea of having a business and figuring lots of things out. I'm looking forward to year 30 and building on what I've established. My word for 2018 is abundance and I'm excited about all that is to come in my 30th year of life! My heart has been heavy and my mind full this week after Charlottesville and such blatant shows of racism and white supremacy. I'm sickened and heavy, but not surprised. Not surprised because white supremacy and racism's roots run deep in our country. White people, we need to not only condemn white supremacy and name it for what it is (I'm looking at you 45), but speaking out about it isn't all we need to do. We have to look at our own hearts, our own lives and work to uproot the racism and white supremacy that's there. We need to understand our role in this system - acknowledge how we benefit from it. Because we like to deny that it's not there, but it is. Like Courtney Martin says, "If you are white, if you’ve been socialized in the United States of America in the 21st century, you are racist. You will be racist until the day you die. There is nothing you can do to escape that fundamental fact." It's easy to say, "Of course racism is bad. Of course we should condemn the KKK and Neo-Nazis and people shouldn't be shouting 'Jews can't take our place." But it's harder to look inward at ourselves and to recognize that white supremacy goes far beyond such bold, outward showcases. We can't condemn the terrorism that happened last weekend and then turn a blind eye to the inequalities that happen every day in places like our education and criminal justice systems. Here are some examples of how white supremacy manifests itself. I've heard people say, can't we use another word other than white supremacy? No, we can't. We have to name what it is. When we name things they begin to lose their power because we start dragging them out into the light. Some people have said to me, okay, I get it. We have a problem, but what can we even do? First of all, we don't get to be silent anymore. We never should have been in the first place, but choosing silence, choosing to disengage, choosing to "not get political" and even feeling helpless is a sign of the privilege we have as white people to check out because something doesn't affect us. Remain aware of this privilege and continue to speak out against hate, racism, antisemitism, islamophobia, etc. Don't let yourself forget. White People: I Don’t Want You To Understand Me Better, I Want You To Understand Yourselves by Ijeoma Oluo: "Your survival has never depended on your knowledge of white culture. In fact, it’s required your ignorance. The dominant culture does not have to see itself to survive because culture will shift to fit its needs." We Need to Keep Talking About Charlottesville by Brené Brown: This is a video and worth every second you'll spend watching it. Brené talks about the importance of 3 P's: Perspective, Power and Privilege. So You Want to Fight White Supremacy by Ijeoma Olu: "Because we all interact with the system of white supremacy, because we all uphold it to some degree — we all have some power to tear it down." For Our White Friends Desiring to Be Allies by Courtney Ariel: "Above all, I urge you keep trying. You're going to make mistakes; expect this. But keep showing up. Be compassionate. Lead with empathy, always. Keep learning and growing. If you do this, I truly believe you’ll be doing the work of an ally." There's so much more that could be said and needs to be said, but hopefully this is a good place to start. I know I say things imperfectly and not always the best way, but we have to commit to talking about this even if it's not perfect. I am always learning, stumbling and growing. "Those of us targeted by white supremacy do not get a moment’s rest — and if you are not targeted by white supremacy, that should keep you up nights as well. Do not give up, do not rest, until the system of white supremacy is reduced to rubble. You may not see it in your lifetime, but your efforts will help ensure that many more of us will live long enough to do our part." There is a system to dismantle. So we've gotta get to work. It's not just for "politically involved" people or "justice oriented" people...it's a call for ALL people. Especially if you claim to follow Jesus y'all...he was ALWAYS on the side of the oppressed and marginalized. He spoke up and spoke out. This is not the time to be silent. I’m seven months into this journey of starting my own business. It hasn’t been easy and most days I’m asking myself what I even think I’m doing? It’s easy to let the doubts and the fear scare me away from my vision and goals. I confess that too often I decide to quit and then I wake up the next morning, realize I can’t quit and I keep on keeping on. Before I decided to start this business and was discerning what I should do I talked to the different people in my life who I can always count on for wisdom and good advice. One night specifically I called a meeting with three of my friends. I told them all of my thoughts, I shared with them my heart, dreams and ideas. I told them this was crazy and probably a terrible idea. They didn’t pressure me one way or another, they actually told me it was a good idea and they listened and asked good questions. They held space for me. They held my hand and prayed for me and what is to come. It was one of the most holy moments I’ve ever experienced. Even thinking about it brings tears to my eyes. That has become my mantra. Fear is almost always why I want to quit. Fear has a way of screaming across my soul that what I want to do doesn’t matter and that I’m not the one capable of doing it. Fear has a sneaky way of planting those seeds of doubt and reminding you often of how you could fail. I don’t love to fail. I mean most people don’t want to fail, but my whole life if I thought I would fail at something I just wouldn’t do it. It’s a terrible way to live and I’m slowly unlearning that habit. A fear of failure will shut us down and not allow us to make the mistakes and take the chances we need to in order to fully live and be who we are meant to be. We can’t listen to the fear. Fear screams where faith whispers. If I silence the fear and go against the urge to quit it all, I hear that still, small voice that whispers peace and reassurance across my soul. The voice that reminds me that I didn’t come to this decision lightly. That even if my business fails, I’m not a failure because I am so much more than a business venture I decided to try. It reminds me that my value and worth doesn’t come from what I do, that’s not who I am. And I remember that most things worth doing will make you afraid. If there’s not a little bit of fear involved, is it really even worth it? So here’s to doing things that make us afraid - may we try them wholeheartedly and celebrate the failure as much as the success because at least we tried and there’s always something to learn. May we use the fear to ignite our passion rather than let it smother it. May we quiet the fear and create space for the whispers of faith. May we never uproot in fear what we have planted in faith. If you’re interested in learning more about my business you can find out more here. Or if you want to stay up to date and receive more blog posts like this subscribe here. Thank you for reading! Y'all I got to cross something off my bucket list!! I was the guest on a podcast last month. I have fallen in love with the podcast medium and podcasts fill my ear buds pretty much daily so the chance to be on a podcast was something I've wanted to do. When I heard about Our Daily Rest, I was so excited to be a part of it. Matt Heffner started Our Daily Rest to help people cultivate a life of restfulness, wellness, and balance. After learning more about him and the mission and vision behind Our Daily Rest I knew we would have a lot to talk about. I always love talking to like-minded people about self-care and we had a great conversation. I talked about the Enneagram and how that contributes to our personal growth and can inform our self-care. I also realized after listening back that I have a loud laugh...so if you don't mind self-care and Enneagram talk with a little bit of too loud laughing you should definitely take a listen! You can listen to the show here. Or if you're a regular podcast listener you can look up the Our Daily Rest podcast on your favorite podcast app and find my episode. If you listen and you want to dive deeper into the Enneagram or need someone to walk alongside you on your journey, I would love to chat. Just drop me a note and let me know!